2018 seems like a bad time to be a Republican just about anywhere. So you would think it would be even worse to be a Republican in deep-blue Massachusetts, where Hillary Clinton won by 27 percentage points in 2016. But the state’s GOP governor, Charlie Baker, is doing just fine, thank you. Actually, way better that fine: Baker, who is running for re-election in November, may be the most popular statewide elected official in the U.S. Of either party. A MassINC poll released late last week for Boston’s WBUR radio station found that 66 percent of Massachusetts registered voters have a favorable view of Baker while 14 percent have an unfavorable view. That +52 net favorability rating is, of course, much better than President Trump’s in Massachusetts (-39). But it’s also ahead of Massachusetts Sen. Elizabeth Warren’s (+17), and she is not only a Democrat but also considered a leading figure in the party and a possible 2020 presidential contender. In these partisan times, Baker’s popularity might seem a bit out of place. So what’s going on? Baker is a moderate, or perhaps even a liberal, Republican — The Massachusetts governor announced publicly that he would not vote for Trump (or Clinton) in 2016. He opposed efforts by Trump and congressional Republicans to repeal Obamacare and Trump’s ban on people from certain countries, many of which are majority-Muslim, from traveling to the U.S. In the wake of the recent school shooting in Parkland, Florida, he has spoken in favor of more gun control measures. He supports abortion rights. Massachusetts has a history of GOP governors — The state that launched the political careers of major Democratic figures such as Michael Dukakis, John F. Kennedy, Ted Kennedy, John Kerry and Warren has had only one Democratic governor (Deval Patrick) since 1991. Mitt Romney was the governor of Massachusetts before he became the GOP presidential nominee in 2012, leading in a centrist style that resulted in his signing the Massachusetts health care law on which Obamacare was modeled. Governors can escape partisan gravity — Increasingly, blue states elect Democrats to the Senate, red states elect GOP senators, and whenever senators don’t vote the way their state leans in presidential years, they get in deep electoral trouble. Those elections have become nationalized. State politics don’t seem to have those same dynamics. Four of the six most-popular governors according to the Morning Consult data (Maryland’s Larry Hogan, Vermont’s Phil Scott, Nevada’s Brian Sandoval and Baker) are Republicans in blue states. John Bel Edwards, the Democratic governor of deeply conservative Louisiana, is also very popular, with an approval rating of 56 percent and a disapproval rating of 27 percent. Two of the least-popular governors are Connecticut Democrat Dan Malloy and Oklahoma Republican Mary Fallin, who in theory should be in step with their states’ political bents. Governors seem to be able to create brands separate from their parties (Edwards touts his support for abortion limits, for example). And they’re held accountable for local concerns — ideology aside (the economy in Connecticut is struggling). Baker seems likely to cruise to victory in November. We’ll have to wait and see if his popularity eventually leads to a challenge to either Warren or the other Massachusetts senator, Democrat Ed Markey. Baker’s moderate record in Massachusetts may preclude him from being a future GOP presidential nominee, but Romney figured it out (sort of). And Baker may be a better politician than Romney, who didn’t run for a second gubernatorial term and may have lost if he had. A Rasmussen poll found that 14 percent of adults are “somewhat” or “very” concerned that the IRS will audit their taxes. That’s down from 23 percent last year. A Morning Consult survey conducted after CBS News’s interview with Stormy Daniels found that 56 percent of registered voters believe that Trump had an affair with Daniels before he became president. Only 9 percent said they did not believe that the affair happened, and 35 percent said they didn’t know or had no opinion. 46 percent of American adults think the government should regulate companies more in their use of people’s personal information, according to an Ipsos poll conducted for Reuters. In a Harris poll this week, 41 percent of American adults who have a Facebook account said they plan to share less of their data on the social media platform in response to the news that Cambridge Analytica accessed the private data of more than 50 million Facebook users. In the poll, 31 percent said they would stop using Facebook to sign into other apps, while only 6 percent said they would delete their accounts entirely. A Rasmussen poll found that about half of American adults, including about a third of Democrats and more than two-thirds of Republicans, believed that the “March for Our Lives” was not likely to drive changes to gun laws. 22 percent of American teachers have considered a career change over safety concerns, according to a Gallup survey conducted this month. In a March CNBC survey, 52 percent of Americans said they had not noticed a change in their paychecks because of the recent tax cuts; 32 percent did notice a change, and 16 percent were unsure. A Fox News poll found that 63 percent of registered voters approve of Trump’s decision to meet with North Korean leader Kim Jong Un. A poll from the Kaiser Family Foundation found that 80 percent of American adults think that the cost of prescription drugs is unreasonable and 72 percent believe that pharmaceutical companies have too much influence in Washington. 72 percent of Jewish Americans think that anti-Semitic sentiment has risen in recent years, per a February YouGov poll. A poll of the Hawaii governor race conducted by Mason-Dixon Polling & Strategy shows Rep. Colleen Hanabusa with a 20 percentage point lead (47-27) over incumbent Gov. David Ige in the Democratic primary. The primary isn’t until August. A SurveyUSA poll in Ohio shows Richard Cordray and Dennis Kucinich tied in the Democratic primary for governor, with nearly half of likely voters still undecided. The winner of that primary will likely face Republican Mike DeWine, who is leading current Lt. Gov. Mary Taylor by more than 30 percentage points. Quinnipiac asked voters in New York City this week whether Gov. Andrew Cuomo or his Democratic challenger, Cynthia Nixon, would be better for the city. Sixty-four percent of Democrats said Cuomo would be better; only 21 percent said Nixon would be. A PPP poll found that 34 percent of registered voters think a hot dog is a sandwich, while 51 percent do not think a hot dog is a sandwich. Japanese voters are split on whether Prime Minister Shinzo Abe should step down in light of a recent scandal and cover-up involving the sale of state-owned land, according to two recent polls. Abe’s approval ratings have also seen a sharp drop. Trump’s job approval rating is 40.2 percent; his disapproval rating is 53.6 percent. 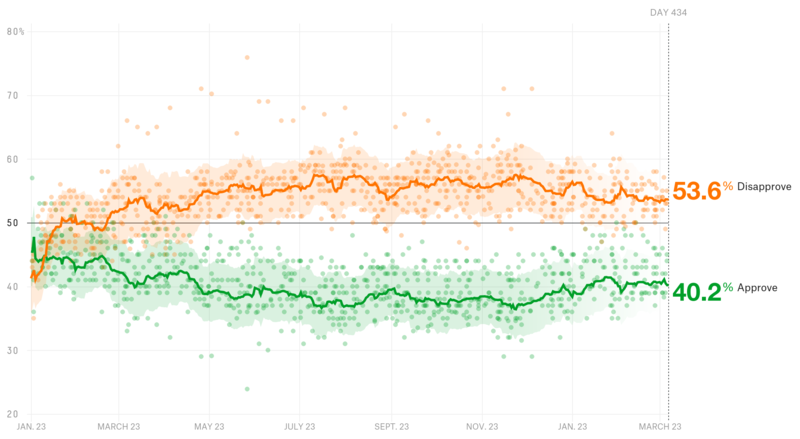 Last week, his approval rating was 40.6 percent, compared with a disapproval rating of 53.4 percent. 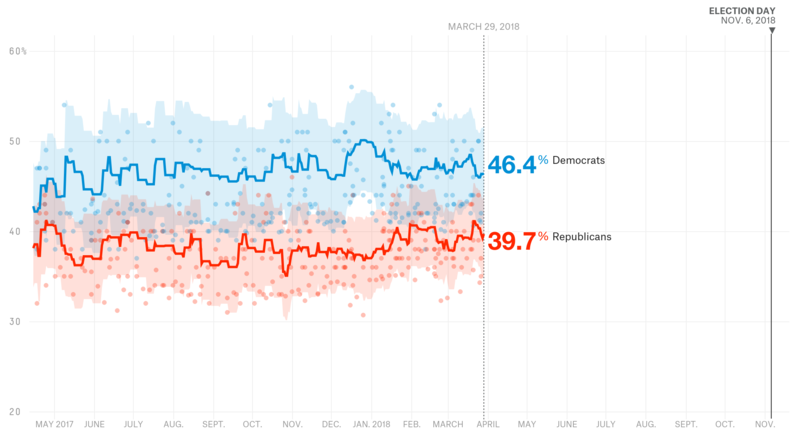 The Democrats hold a 46.4 percent to 39.7 percent advantage on the generic congressional ballot this week. Last week, Democrats were up 47.3 percent to 41.1 percent.